Justin is a city of 3,246 people according to the 2010 census, and is located between Fort Worth and Denton. 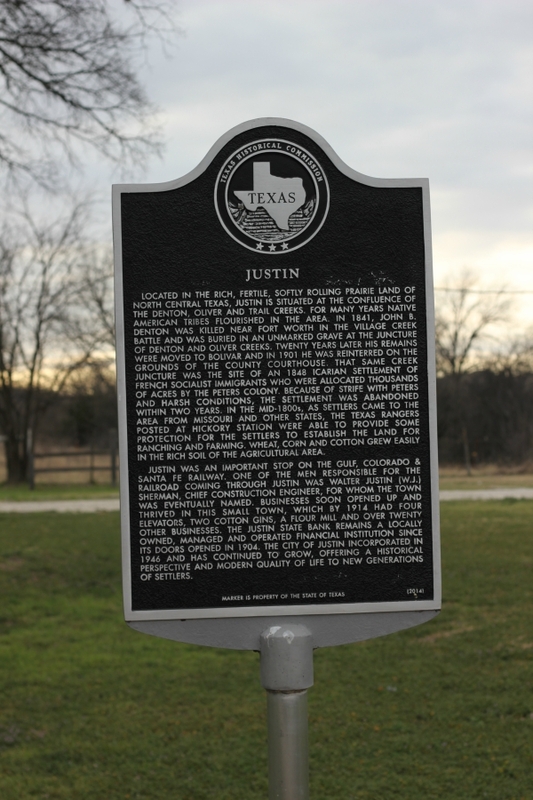 Did you know that the City of Justin is NOT named after the Justin Boot Company, and the Justin Boots company is NOT named after the City of Justin? In 1887, the community petitioned for a post office to be named "Justin", in honor of (Walter) Justin Sherman, a chief engineer with the Santa Fe Railroad. Justin Boots was named after its founder, H. J. "Daddy Joe" Justin. According to the 2000 census, there were 650 households out of which 41.8% had children under the age of 18 living with them, 66.5% were married couples living together, 8.3% had a female householder with no husband present, and 22.5% were non-families. 19.4% of all households were made up of individuals and 9.1% had someone living alone who was 70 years of age or older. The average household size was 2.75 and the average family size was 3.15. The median income for a household in the city was $52,257, and the median income for a family was $61,328. Justin is located within the Northwest Independent School District. Residents are zoned to Justin Elementary School, Pike Middle School, and Northwest High School.